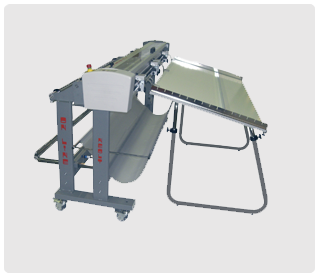 Electro Trim (Electric) A light duty electric paper cutter specifically designed for the single sheet environment. Cutter head is mounted on a round chrome guide rail with ball bearings. The trimmer head cuts in both directions at sixty inches per second. Either the convenient "touch bar actuator" or foot pedal can be used to initiate each trim. The unique design of the end frames on the trimmer permits the cutting of materials longer than the trimmer itself. Fixing bar and roll holder are options. 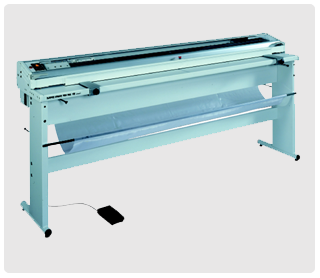 Electro Power Trim Plus (Electric) This high-speed, medium duty workhorse of a paper cutter, features a reinforced cutting head mounted on a square chrome plated guide rail with ball bearings. Cutting head cuts in both directions at twenty inches per second. Trimmer design facilitates horizontal output of trim edge for hand pickup or receiving table delivery. Engineering of the end frames permits the cutting of materials longer than the trimmer itself. Either the convenient "touch bar actuator" or foot pedal can be used to initiate each trim. 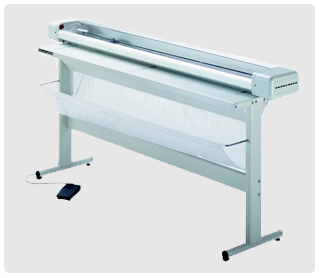 Paper cutter is shipped with an adjustable reference guide, stand and lamp; the fixing bar is a factory-installed option. Electro Strong Trim Pro (Electric) This heavy-duty standard of the industry features tandem dual blades mounted in a reinforced cutting head. The cutter head is then mounted on a chrome plated rectangular guide rail with ball bearings. Bi-directional cuts at variable speeds of up to 19 inches per second are possible, dependent on the composition of the substrate being cut. Design of the electric trimmer permits horizontal output of trim edge for hand pickup or receiving table for delivery. Unit is shipped with stand, lamp, two adjustable reference guides and fixing bar. Roll holder is optional. Electro Super Trim (Electric) This industrial strength, feature rich precision trimmer was designed to meet the exacting demands of large panel sign and exhibit builders. Its heavy duty construction facilitates the trimming of non-ridged substrates up to 65mil thick. Cutter head operates bi-directionally at incrementally variable speeds to match the cutting requirements of various substrates. The cutter head is then mounted on a chrome plated rectangular guide rail with ball bearings and travels at speeds of up to 19 inches per second. Activating a convenient foot petal actuates the cutting function with compressor to activate fixing bar. 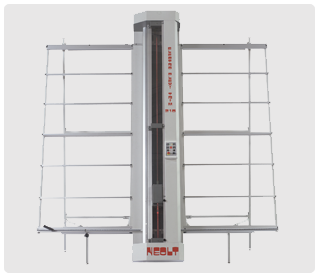 The units electrically operated fixing bar stabilizes the material being cut. The design of the system permits horizontal output of trim edge for hand pickup or receiving table for delivery. The Electro Super Trim is equipped with dual "Laser Designators" which generate a florescent red "cut line", designating precisely where the cutter blade will cut. Unit is shipped with stand, lamp, roll holder and two adjustable reference guides. This is a special order unit check with us for lead times. Plexi-Trim The Neolt Plexi- Trim is an electric powered, high speed cutting system designed to operate in a vertical environment and produce precision cuts up to one-quarter inch deep in Plexiglas, Acrylic, Dibond, Forex, Alibond and Sintra up to 1/4". The router type cutter is supplied with two interchangeable milling heads which can be matched to fit your cutting requirements for clean, smooth, precise finished cuts. Electrically operated dual fixing bars hold both sides of the substrate being cuts so that there is no movement. Cutting speed is continuously variable up to forty feet per minute, dependent on characteristics of the material being cut. The systems "Laser Designator" lays down a vivid florescent "cut line," so that the operator is always able to accurately align the cut prior to beginning the cutting process. The "Plexi-Trim" system control pad gives the operator access to all of the trimmers operating systems including "up and down" motor control, variable speed selector, "panic stop", electronic fixing bar operation and waste take-off. Left and right lateral extensions as well as a vertical support stand are included. Electro "XY" Trim This precision cutter is designed to produce simultaneous cuts on all 4 edges of images being cut from large format rolls or sheets. The systems adjustable optical sensor is able to read a large array of industry standard printed "cut marks" for the precise alignment of horizontal cuts. Multiple vertical cuts are manually set with adjustable slitter blades. LCD keypad control has 9 speed settings, with the capacity of 40 preset channels. Preset channels allow for convenient switching of materials being cut for maximum accuracy. 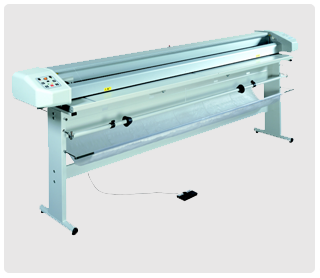 Cutter provides for automatic cut programming for sheeting of blank material. Corrosion resistant, chrome steel cutting blades provide enhanced protection against corrosion and wear. The unit comes complete with stand and waste catch basket. 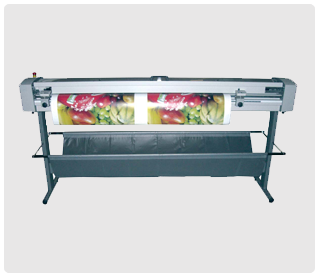 Semiautomatic Trim can be programmed to cut pre-printed rolls.Horizontal cutting carriage (X axis) with rotary blades for the vertical cut as well (Y axis). For the vertical cut the blade is being placed manually and can be adjusted with a millimetric sliding bar. Max cutting width 1650mm, Max cutting thickness 1mm, Horizontal cutting speed 40mt/min, Vertical cutting speed 12,5mt/min.